Newsies the musical on Broadway is best described as a big burst of energy. What better way to spend your time in New York, than to visit a musical about New York history? 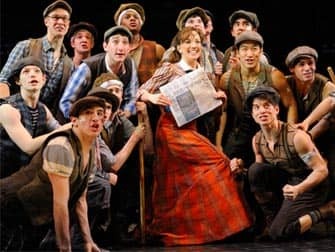 If you are looking for an exciting night out, and want to see lots of dancing and singing as well as a heartfelt story about newsboys, then Newsies is fun for you as well as your entire family. This Tony Award-winning production is based on the 1992 Disney movie starring Christian Bale which in turn is loosely based on the Newsboys Strike of 1899. Newsboys, or newsies, were the main distributors of newspapers to the public in the mid-19th and early 20th centuries in the U.S. In 1899, newspaper magnets Pulitzer and Hearst raised the prices of a bundle of newspapers, making it extremely difficult for the children to make a living. In protest, a successful youth-led campaign was organised defending the – often orphaned – young boys of New York. 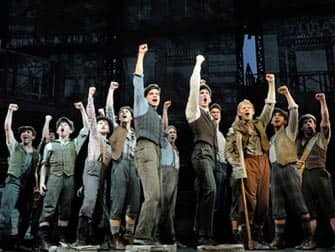 The musical follows the story of Jack Kelly as the leader of the campaign and his dreams of making it big in the world. Enjoy the music of Alan Menken and compelling lyrics by Jack Feldman and cheer on the newsies of New York! 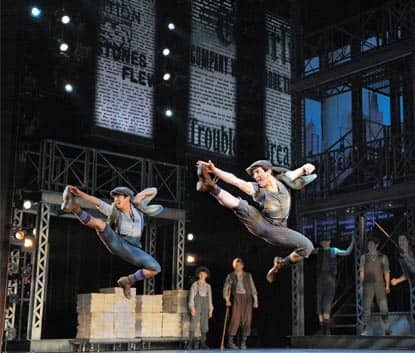 Newsies is full of upbeat songs, great choreography and a story championing the American Dream. It’s youthful and powerful and it will surely have you sitting on the edge of your seat the entire evening. Note: These tickets are cheaper than other websites and even the box office because you do not know the exact seating before you book.